There are many obscure figures in British history, often women, who have been treated only by novelists (see Anne Rooney's post on Filling the Cracks with Gold a couple of days ago). In recent years historians, mainly women historians like Helen Castor, Sarah Gristwood and Leanda de Lisle, have done a splendid job of bringing into the foreground subjects from Matilda to the Grey sisters, Jane, Katherine and Mary. But there is one person whose life story still deserves more attention - Henry the Eighth's younger sister Mary Rose. 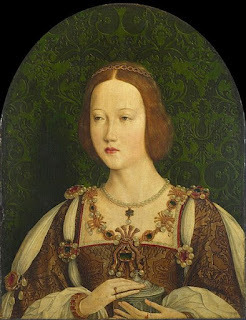 Henry was very fond of her and named his first daughter after her, who went on to become the much more famous Mary Tudor, the first Queen Regnant of England. 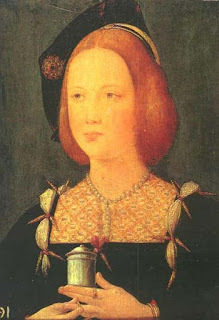 Indeed an Internet search for Mary Tudor will take a long time before it reaches the woman above, reputed by contemporaries to be the most beautiful woman in the land. The unknown artist of the portrait above has captured something of this with the red gold hair that was characteristic of her brother too. We know far more about Henry's other sister Margaret Tudor, who married James lV of Scotland and became grandmother (twice over!) to the most famous Mary of all, the Queen of Scots. But this Mary was, like her older sister, a useful piece in the game of royal marriages, a dynastic pawn that could be made a queen. And she was, at the age of eighteen. Her husband was Louis the Twelfth of France, a man more than thirty years older than Mary and one desperate to sire an heir (yes, that motif again.) Legend has it that he tried so hard in their bedchamber that it caused his death three months later, but to no avail. We don't know anything about their relationship, except what can be inferred from what happened next, but it does seem likely that it was a relief to Mary to be widowed so swiftly. The newly free Mary soon turned her mind to her next husband. Even during the marriage negotiations with Louis, she had written to her brother, saying that "if she survived him, she should marry whom she liked." And "whom she liked" was Charles Brandon, the first Duke of Suffolk. In fact Heny was quite aware of the couple's mutual attraction and had discussed a possible marriage with Brandon, who was a very close friend, only stipulating that they should wait to return from France before Brandon proposed to Mary. Brandon was dispatched to bring Mary home - somewhat unwisely considering Henry's reservation - but the young woman who was strong-minded enough to tell the king her brother that she would marry an old man to please him only if she could choose her next husband soon swept aside the restriction and married Charles Brandon in secret some time in February 1515, a matter of weeks after King Louis' death. But allowing him to marry his sister would put her outside the useful dynastic marriage market and Henry was perhaps not ready to let such prospects go for a royal princess and former queen of not yet twenty. However, his affection for both of them and the intervention of Cardinal Wolsey caused Henry soon to calm down and he was present at their official marriage in May; he even reduced the fine, though he didn't remove it altogether. Brandon had technically committed High Treason by marrying a royal princess without the monarch's consent and Henry needed to let him know who was boss. Mary's story is full of "what if? "s - the cracks that a historical novelist longs to fill with gold. What if she had married Charles Castille and become his Empress? What if Louis hadn't so conveniently died and she had borne him an heir? Would Brandon have waited for her? His own matrimonial history was quite chequered, as Gunn's book shows. He was first contracted to marry Anne Browne, a waiting woman of Queen Katherine, and got her pregnant. But then he broke off the contract to marry Anne's aunt! Dame Margaret Mortimer was twenty years older than Brandon and very wealthy. Soon after their marriage Brandon had it annulled on grounds on consanguinity but not before he had claimed some of Dame Margaret's dowry. 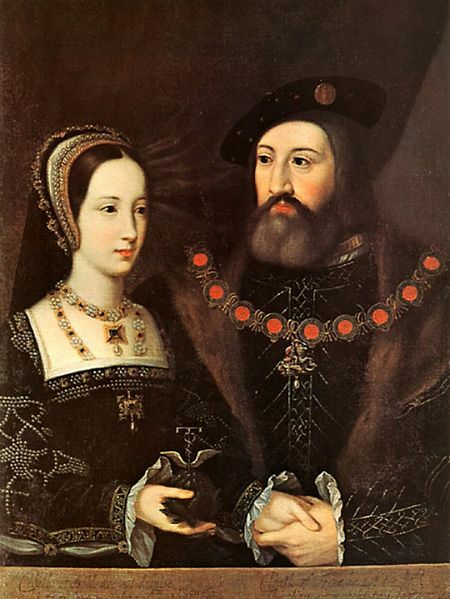 He then married Anne, first secretly and then publicly after pressure from her family, and she bore him a second, legitimate daughter but died soon afterwards in 1510. Nor is that the end of his marital shenanigans as he then became contracted to Lady Elizabeth Lisle, who was his eight year old ward. What made this man such an irresistible marriage prospect that at least three women were prepared to marry him, some of them under pressure not to? (He later had three illegitimate children too, by mother or mothers unknown). Charles Brandon is supposed to have been very handsome though there is no portrait evidence of that, very athletic and vigorous, a champion in the lists. But he was always short of money, not always successful in the many military engagements Henry sent him on and clearly not a faithful lover. The biggest "what if?" of all in Mary Tudor's history is what would have happened if she had not died in 1533. She bore Charles Brandon four children, two sons and two daughters. The first, Henry, died at eleven. 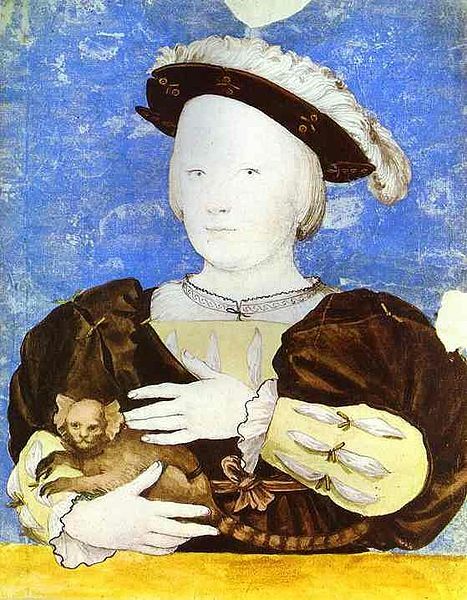 The second son, born after his brother's death, was also called Henry in an apparently relentless quest to flatter and appease the king, but he too died before he reached manhood. But either of these Henrys would have been strong candidates for the succession after the death of Edward the Sixth, as legitimate nephews of Henry. 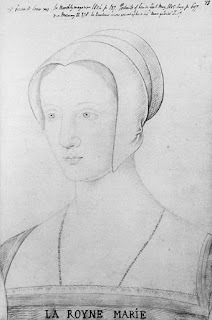 The first daughter of Mary and Charles Brandon, Frances, married the Earl of Dorset and became the mother of Lady Jane Grey and her two younger sisters, leading to the tragic short reign and execution of Jane, who was nominated as Edward's heir. But Mary did die in 1533 and Charles, being Charles, within three months married his fourteen-year-old ward Catherine Willoughby. She was betrothed to young Henry, Charles's son but he was considered too young to marry and Charles didn't want to lose her lands. Their two sons (another Henry and a Charles) died within hours of each other in 1551, of the sweating sickness. Since Charles had died in 1545, both boys became Dukes of Suffolk, though the younger enjoyed the title for only an hour or so. So the Duchy of Suffolk, having no legitimate male heirs to the title, went to the husband of Frances, Mary and Charles's older daughter. It was not uncommon for women in the first half of the sixteenth century to die before they were forty and being royal was no protection. The second Mary Tudor was forty-two and she had not had any actual pregnancies to weaken her. 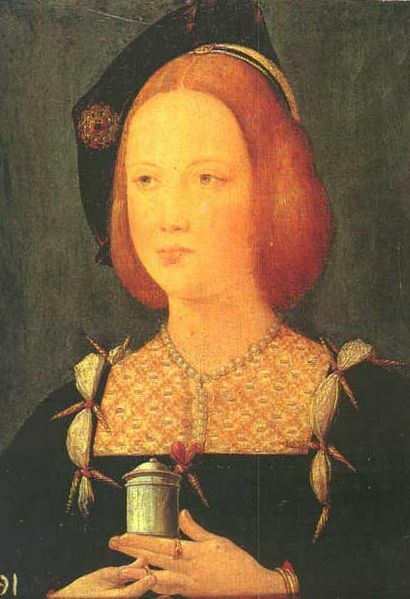 The first Mary Tudor had a close relationship with Katherine of Aragon and fell out with Henry over his divorce. 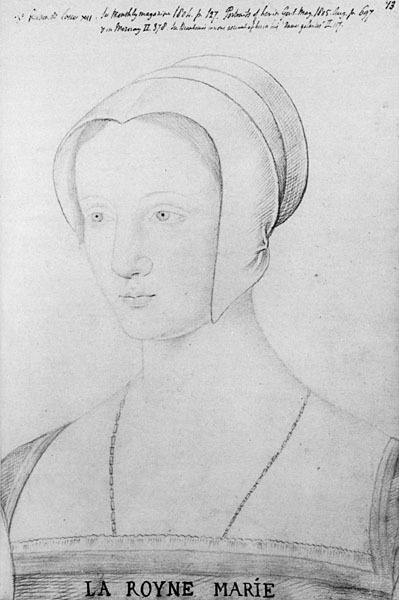 And she took against Anne Boleyn, who had been a waiting woman in her retinue when she went to France to marry Louis. What little we know of her shows the first Mary Tudor to be strong-minded and independent and deserving of more of our attention than she has had to date. Interesting how different that second portrait is from the other two. For one thing, she's dark haired! Charles Brandon was quite a character, wasn't he? As you say, he must have been quite charming, not only with the women, but with Henry. Anyone else might have found himself minus a head after what he did! It's striking to find the names Brandon and Willoughby in this royal tangle. Did Jane Austin have a particular interest in this bit of history? It's a long time since I read them, but I've a feeling Mary featured in some of Dorothy Dunnett's books...? I believe you're right, Sue Purkiss. She also featured in "When Knighthood Was in Flower" by Charles Major - a romantic (if not strictly historical) telling of the Brandons' relationship, but a good read. In the early Hollywood film of the novel, Marion Davies played Mary; I have been hoping to see that for some time, but have not had the pleasure as yet.